Hundreds of thousands of teenagers in England, Wales and Northern Ireland are bracing themselves for their A-level results. In England, A-levels have been moving away from coursework and returning to students being marked on final exams. But exams regulator Ofqual is promising standards will be held steady to ensure students do not lose out amid changes. This means grade boundaries could be lowered, once papers were marked, if exams were tougher than expected. Last year, students in England took new, more challenging exams in 13 subjects, with 11 more following this year. The remaining subjects are being refreshed over the next two years. What's new about this year's A-levelsClearing: "It's not the end of the world"
A-levels have also been separated from AS-levels in England, which meant many schools dropped the old system which allowed students to study a wider range of subjects post-GCSE, dropping their weakest after a year. Last year's results showed a slight fall in grades for the 13 reformed subjects and for the first time in 17 years, boys outperformed girls in numbers of A and A* grades, prompting suggestions that this was because of the new style of exams. Prof Alan Smithers, director of University of Buckingham's Centre for Education and Employment Research, said he expected both trends to continue as changes are phased in across all subjects. But he said Ofqual's strategy of lowering grade boundaries to compensate for the tougher exams would mean overall results would be similar to 2017's. "Ofqual is propping up the grades of the new tougher A-levels, so overall the results are likely to be close to what they were last year. "If, anything, they are likely to go down due to the new A-levels, unconditional offers leading to some students taking their foot off the pedal and the uncoupling of AS no longer allowing students to choose their best subjects halfway through the courses." The rise in unconditional offers could mean clearing, the process by which universities fill their unallocated course places, is less busy. 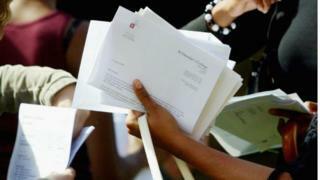 Ucas says that last year about one in eight people accepted to full-time university courses got there through clearing. A dip in the number of 18-year-olds could also mean less competition.In the year 2000, when the majority of this year's cohort were born, there were 604,441 births in England and Wales - 74,665 fewer than last year's figure of 679,106. » Exams: How do the new 9-1 GCSE grades work?